Inviting Quotations for supply of Stationery Items. Inviting Quotations for Licensed version software. Inviting Quotation for Purchase & Supply of Books on Unit Cost Basis. Invites e-Tender Notice for Purchase of Printing Paper for its Head Office, New Delhi. Inviting Quotation for Purchase of Paper Stock its Regional Office at Mumbai. Inviting Quotation for Purchase Art Card its Sub-Office at Chennai. Tender Notice : Conceptualization, Designing and Fabrication of Stalls for World Book Fair to be held at Pragati Maidan, New Delhi. CORRIGENDUM : Tender Notice for Conceptualization, Designing and Fabrication of venue for Festival of Letters 2019 to be held from 28.01.2019 to 02.02.2019 at Rabindra Bhawan Lawns, New Delhi. Quotation for Purchasing Papersfor its Regional Office at Kolkata. e-Tender Notice for Purchase of Printing Paper for its Head Office at New Delhi. 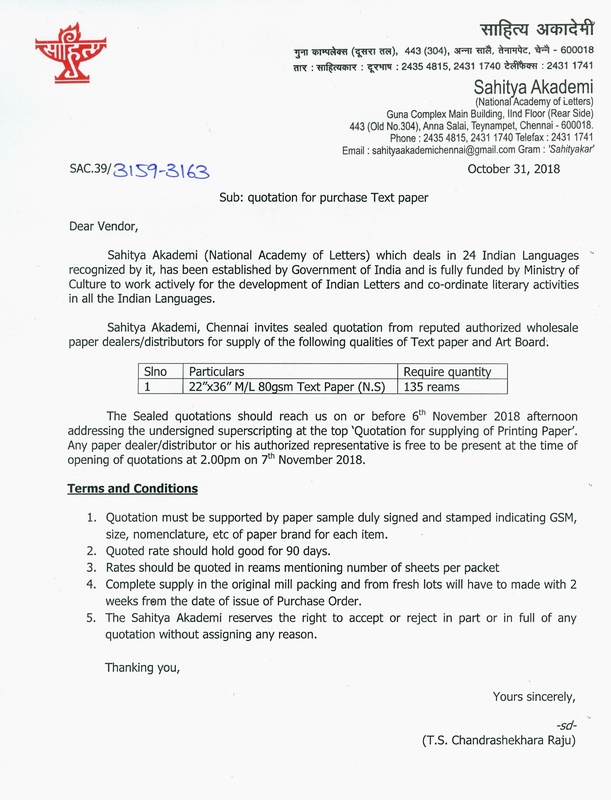 e-Tender Notice for Purchase of Printing Paper for its Sub-Office at Chennai. Inviting Quotations for renewal of 2yrs maintenance subscription of Corel Draw. e-Tender Notice for Purchase of Printing Paper at Sahitya Akademi, Sub-Office, Chennai. e-Tender Notice for Auction of old/obsolete items at Sahitya Akademi, Head Office, New Delhi. Inviting quotation for procurement of Envelops at Sahitya Akademi, Head Office, New Delhi. Inviting quotation for procurement of Non-Woven Bags at Sahitya Akademi, Head Office, New Delhi. Quotation for Purchasing Papers (Kolkata office). Re-Tender for Comprehensive Annual Maintenance Contract of AIR Conditioners Window/ Spilt/ Ductable/ Cassette. Tender for Comprehensive Annual Maintenance contract of CCTV surveillance System. Tender for Comprehensive Annual Maintenance contract of Air Conditioners Window/Spilt/Ductable/Cassette. Inviting quotation for Translation Prize function and Abhivyakti programme scheduled to be held from 22-24 June 2018 at Guwahati. Tender Notice for Hiring of Vehicles. 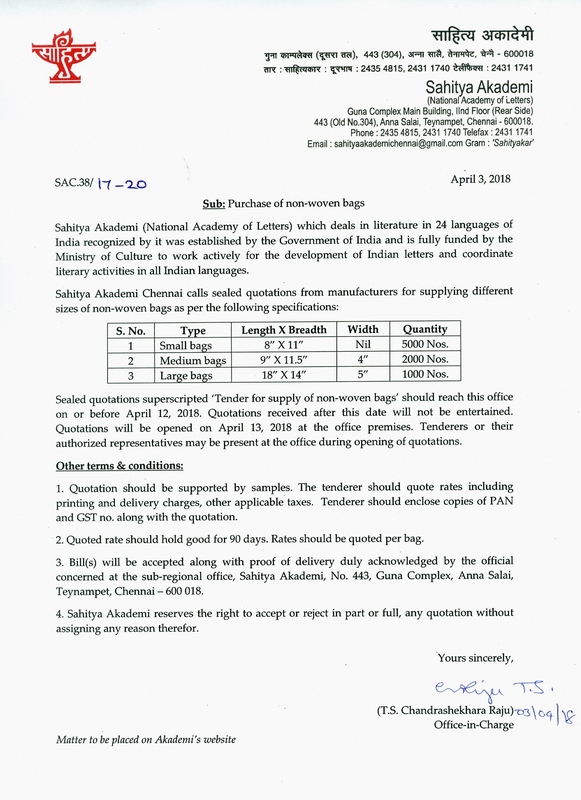 Inviting quotation for supplying of different size of non-woven bags at Sahitya Akademi, Chennai. Advt. for the post of Graphic Designer (Contract Basis) at Head Office. (Date extended upto 26th December 2017) Tender Notice for Conceptualization, Designing and Fabrication of Venue for Festival of Letters 2018. Tender Notice for Conceptualization, Designing and Fabrication of stalls for World Book Fair to be held at Pragati Maidan, New Delhi. Tender Notice for Designing and Fabrication of stall at Central Library, Jawaharlal Nehru University. Notice for e-Tender for Purchase of Printing Paper. LAST DATE EXTENDED UPTO 14th January 2017, 5.00 pm Tender Notice for Conceptualization, Designing and Fabrication of Venue for Festival of Letters 2017 to be held from 21.02.2017 to 26.02.2017 at Rabindra Bhawan Lawns, 35 Ferozeshah Road, New Delhi-110001. Quotation for procurement of Seminar Bags. LAST DATE EXTENDED UPTO 12 January 2017, 5.00 pm : Quotation for printing and supply of envelopes. Quotation for procurement of Office Furnitures & Fixtures. Tender Notice for Conceptualization, Designing and Fabrication of Venue for Festival of Letters 2017 to be held from 21.02.2017 to 26.02.2017 at Rabindra Bhawan Lawns, 35 Ferozeshah Road, New Delhi-110001. Inviting Quotations for the Purchase of Sony HD Camcorder for Regional Office, Chennai. Inviting Quotation for purchase of non-woven Bags [Corrigendum]. Inviting Quotation for purchase of non-woven Bags. Inviting quotation for Fabrication and Designing of 6 Stall for World Book Fair, Pragati Maidan, New Delhi. Quotation for Fabrication of Book Stall for JNU Book Exhibition. Inviting Quotations for 'Annual Maintenance Contract' of Kirloskar Silent Generator Set-reg. Inviting Quotations for Fabrication of Stall for Delhi Book Fair, Pragati Maidan. Notice Inviting Tender for Purchase of Paper. Notice for Auction of Condemned Vehicle. Inviting Quotations for BULK MAIL SERVICES/SOFTWARE AND MAILER CREATION. Inviting Quotations for purchasing Paper (Regional Office, Kolkata). Inviting Quotations for supply of Photocopier Paper. Inviting Quotations for 'Annual Maintenance Contract' of Sound/Conference System. Inviting Quotations for 'Annual Maintenance Contract' of Fire Alarm System. Tender for Conceptualization of Design, Interior and Exterior of Sahtiya Akademi Book Shop at Gate No.-4, Vishwavidyalaya Metro Station, Delhi.